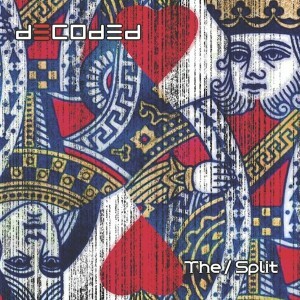 Three days ago I began listening to Decoded’s 4-song release The Split and have been struggling ever since to pinpoint exactly what pleasure centers in my brain it tickled the most… and for that matter, why. You see, for every reason the teenager in me cranks it loud when a straight rocker comes on, the intellect in me is equally delighted when pithy, witty lyrics lay out casually above the ruckus. And while my need for testosterone-fueled guitar licks and cymbal-bashing drums is met, I find my cup runs over in the vocal harmonies department. So what is it, “Espresso-fueled Art Rock?” Nah, that doesn’t quite get it. Perhaps “Crunch-Pop?” That sounds like a kid’s cereal. I think I’ll settle on “Melody-Core.” Yeah that seems to get closer. Decoded’s style is undoubtedly formed from the refined and honed scraps of several past projects that come together perfectly to blend super-radio friendly vocals and fantastically balanced guitars into a musical force to be reckoned with. This combo is perhaps most prominently featured on the song “Open Season” when clean-gritty guitar sound gives way brilliantly to dual-chorus vocals that make it feel sing-along-able and rock-anthem at the same time. Is it going to melt the faces of the elderly or make them think you might sacrifice their pets if left out overnight? Well, no… Nor will it make you want to smash guitars and set fire to things. It will, however, make you take note, hit repeat and play this one through a few times before it leaves your heavy rotation. While I can’t tell you how to re-produce this Decoded style, I imagine it involves a heavy helping of Third Eye Blind’s brilliant Blue. Next, blind-fold a monkey and have him pick at random any two Weezer albums and a New Found Glory disc. A pinch of Depeche Mode. Mix well… and you’re getting close. Mind you, this is a collection of songs I wouldn’t hesitate to slip into the rotation for any gathering. I really feel like several of these songs can easily be used in movie soundtracks, or placed into your next road-trip mix. It’s good, it’s edgy, it’s solid, and it’s got plenty of hook. Decoded is refreshing. It’s crisp, but not clean. It’s edgy, but not offensive. Thought-provoking lyrics, magnificent vocal quality, well-structured and gifted song-writing really tells of the experience that stands behind this offering. All told, it is a really solid offering that makes me wonder what more can come of this Los Angeles based band. This entry was posted in Reviews and tagged Bandcamp, Decoded, Los Angeles, music, Open Season, review, soundcloud, The Split by Greg. Bookmark the permalink.